Tonight at the Victoria and Albert Museum, Kate debuted more jewels that previously belonged to the Queen Mother: her sapphire and diamond fringe earrings. The Queen Mother began wearing the earrings sometime after her coronation. 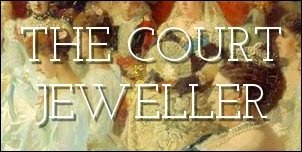 Posters at the RJWMB have speculated that they were perhaps made to coordinate with a suite of sapphires given to Elizabeth as a wedding present by Queen Mary, though to my knowledge, that's never been officially clarified. Queen Elizabeth II would have inherited these earrings (along with the rest of her mother's jewels) when the Queen Mother died in 2002. The Queen Mum wore the earrings occasionally throughout her life, including at a 50th birthday reception for Prince Charles in 1998 and on the celebration of her own 93rd birthday (pictured above). Kate has been slowly adding to her cache of jewels from the Queen Mum's collection. By my count, so far we've seen her wear the Cartier Halo Tiara, the Lotus Flower/Papyrus Tiara, the Maple Leaf Brooch, and the bracelet made from one of Queen Mary's choker necklaces.